The main difference between alternate host and collateral host is that the alternate host and main host of a particular parasite belong to different families whereas, the collateral host and main host of a particular parasite belong to the same family. 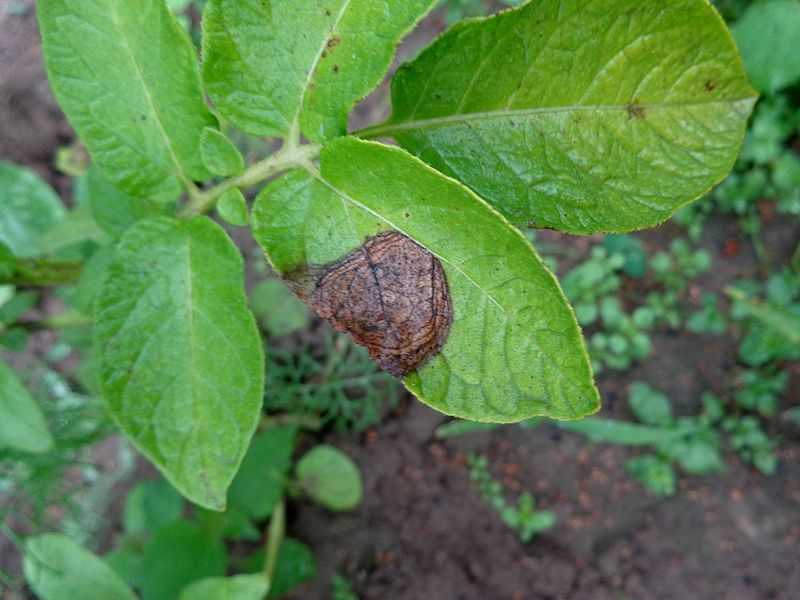 Furthermore, alternate host helps in the completion of the life cycle of the parasite while collateral host helps in the survival of the parasite. Alternate host and collateral host are two types of hosts that help in the survival of the parasite. They are collectively called subsidiary hosts. Alternate host is a host other than the principal host on which the parasite can survive. It means that the parasite uses the alternate host only for the completion of its life cycle. 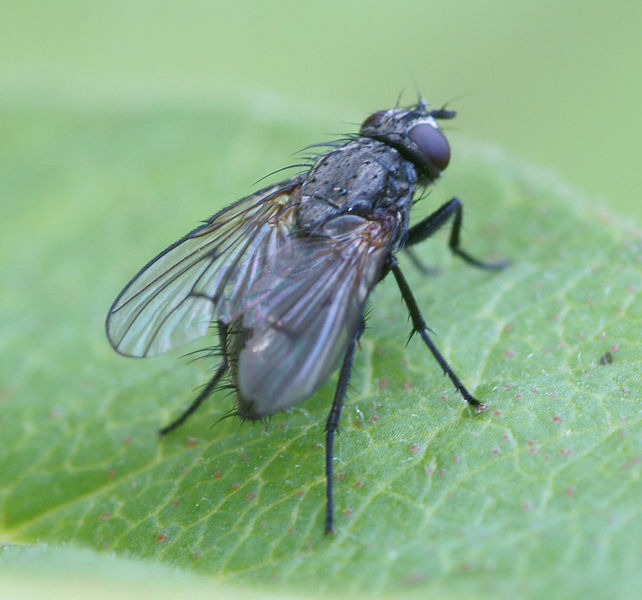 For example, parasitic insects like black fly overwinter on an alternate host in the form of eggs and in the autumn, they migrate to their main host, the spindle tree. But, the alternate host and the main host of the parasite belong to different families. Also, when the main host is not available, parasites depend on the alternate host. For instance, hawthorn serves as an alternate host for fire-blight bacterium whose main host is pears or apples. The collateral host is the host that help in the survival of the parasite. The most significant feature of the collateral host is that the main host, as well as the collateral host of a particular plant parasite, belong to the same family. For example, wild grasses and wild rice serve as collateral hosts to the fungi that infect grass and rice species, respectively. Alternate host and collateral host are two types of subsidiary hosts that help in the survival of plant pathogens when their main host is not available. They aid in the survival of the parasite during unfavorable seasons. Also, both types of hosts are important in the eradication of the parasite by means of biological control of plant parasites. Alternate host refers to a host on which some pathogens must develop to complete their life cycles. While, collateral host refers to a host that belongs to the same family of the main host, aiding the survival of the parasite during off-seasons. These definitions, thus, explain the fundamental difference between alternate host and collateral host. Alternate host and the main host of a particular parasite belong to different families while collateral host and the main host of a particular parasite belong to the same family. We can consider this as the main difference between alternate host and collateral host. Moreover, alternate host aids in the survival of the parasite by allowing the completion of its life cycle while collateral host aids in the survival of the parasite when the main host is not available. Another difference between alternate host and collateral host is that alternate host is important in the survival of the parasite under unfavorable weather conditions while collateral host is important in the survival of the parasite under the off-seasons of the main host. Puccinia graminis tritici, which causes stem rust of wheat, survives on barberry as an alternate host while Alternaria solani, a fungal pathogen attacks the members of the Solanaceae family as their collateral hosts. Alternate host is a host that does not belong to the family of the main host of a particular parasite. However, it helps to complete the life cycle of the parasite. On the other hand, collateral host belongs to the family of the main host of the parasite and it helps in the survival of the parasite when the main host is not available. 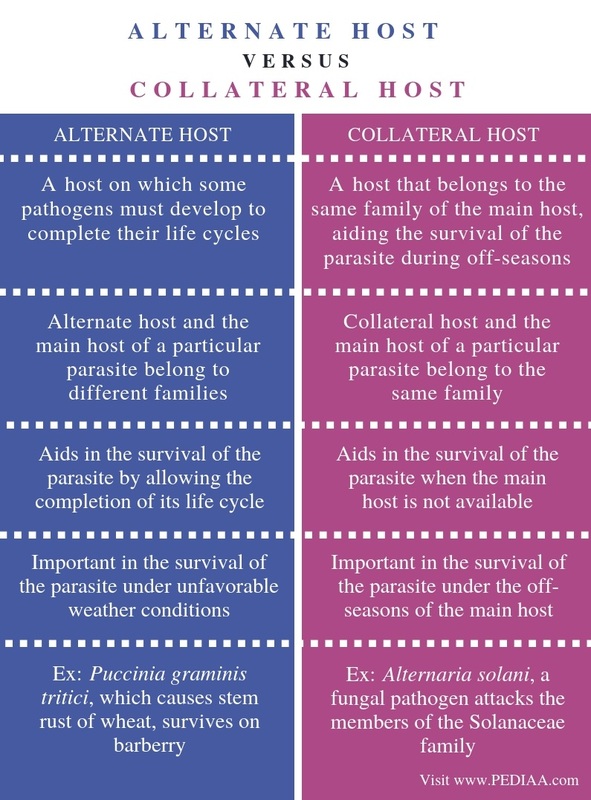 Therefore, the main difference between alternate host and collateral host is the family of the host and its importance to the survival of the parasite.